Sorry, perhaps my english language isn't too good.. Preparing myself for SCJP 6, Please God help me, i can do nothing without You.. 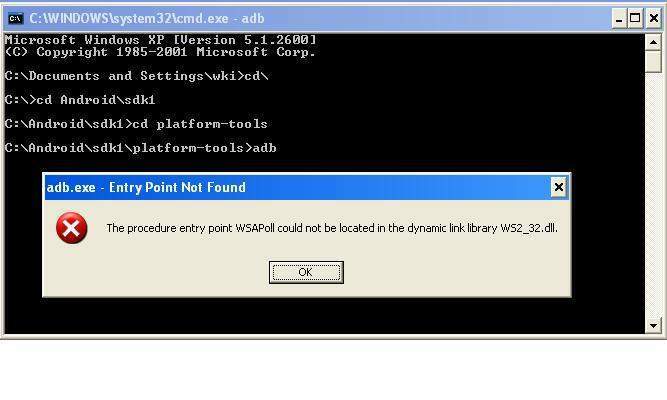 I've tried to open the Ws2_32.dll by using Depedency Walker, but can't find method called WSAPoll. I got an information from other forum says that WSAPoll is a command that's not exist in the WinXP platform. I've got this issue resolved now. 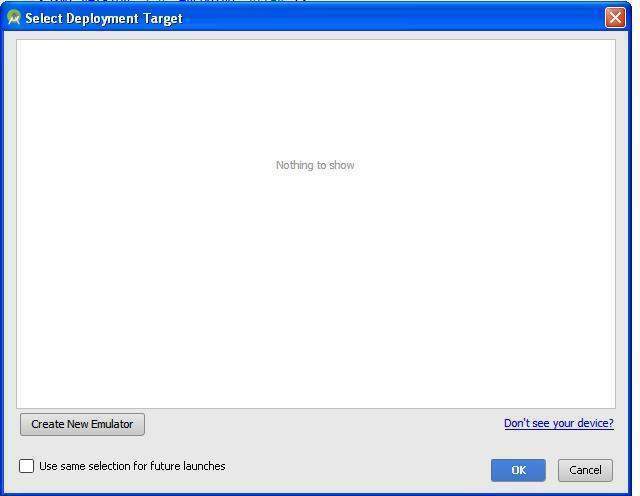 The problem was, i updated the platform-tools, seemingly the latest platform-tools wasn't compatible for WinXP. Right now i switch back to use Android Studio 1.4.1 and use the original ADB that's bundled with it. i won't re-download the platform-tools. I use Windows XP to run Android Studio 2.1.2. The Android Studio was fine, i could select the destination Device to install my APK, by clicking Run button. I've tried to re-install Android Studio 2.1.2 on my computer, but the error still remains. Kindly your help on this issue. Currently i'm facing an issue on displaying dynamic Graph in a AsyncTask. The Graph won't showing all of sudden, the data is received correctly from the server (in JSON format). I've got this issue resolved in just a few hours i posted the question. (finallly!!!).. I just removed android:noHistory="true" on the activity defined in the AndroidManifest.xml. I'm facing a strange issue on capturing an image, the application suddenly crash (suddenly closed) as soon as i click the capture button in the camera application. I've been trying to find the solution for this error for 2 days, but no solution yet. I use kbeanie image chooser library for capturing the image. The capturing image is called in a Fragment, but the captured imaged will be shown in an Activity called ImagePickerActivity. I would really appreciate it if you could help me to resolve this issue. What's the most frequently LookAndFeel used on Windows OS? I want to hear from you regarding the most frequently java LookAndFeel you use for java application that runs on Windows OS? Do you use Windows Look And Feel? I'm really curious, is it possible to put quotes in generated table names and column names? Then this class will be converted into table and column names as defined in the class. With that class, how to set and tell the Hibernate to create table name to be 'Student' and column names to be 'id', and 'name'? Is it possible GUI inside C or C++ DLL? Currently i'm tasked to modify DLL application, by adding Dialog / User Interface hardcoded in the DLL. The requirement is before the DLL can start its functions, user has to do some selection on the user interface, and the DLL will run with based options selected. As far as i've done, i can only display MessageBox from DLL, to display an error when the process is failed or an error occurred. I want to add some buttons and images and checkbox-es on that GUI. Sorry, i'm quite stuck. Could you please tell me how to achieve that? I have no idea at all. What's the best commercial installer application for Java Desktop? Thanks for the thought given. Wow.. that's a surprise for me knowing that there's btrace project, which can trace the byte code being loaded. Ok. What if i combine the methods, obfuscating the jar first and then encrypting the jar? Will that give some additional protection? Currently i'm considering to purchase a installer application for Java. As we know that there are some software available in the market which offers Encrypt/Decrypt on executable jar. Which means the byte codes will be decrypted first, but before the JRE run the decrypted byte code, the when it's being executed. I consider it as "Decryption on the fly", I think this idea is awesome. May i know your opinion or suggestion regarding which installer application that is the best in their class? Is obfuscated code can be decompiled easily? So, does it mean that no matter how much effort to obfuscate our byte code, the byte code could still be reversed engineered? Sorry, could you please explain in detail about license declaration that you mentioned? A stronger method to prevent reverse engineering or hacking would be to choose to write your application in a compiled language rather than an interpreted language. So, this means that i will have to choose other programming language, doesn't it? If i embed some codes for crucial things in JNI such as database access or GUI design, and the other codes are only obfuscated, will it help me much to protect my code against reverse engineering? I'm highly curious about the decompiling Java byte code. Is it possible to decompile the obfuscated code, which have been obfuscated by proguard? I have a plan to distribute my Swing application, i want to make my application can't be reversed or hacked. I'm curious, is it possible to deploy SQLite database in our Application Jar? Actually, i want to do this since, i want to create small application which uses SQLite database as my temporary database. Rather than i will have to store SQLite database in particular directory, i prefer to store it inside application jar. I'm facing a problem with JDBC Transaction. I use SQL Server 2005 as Database of my company's machine since the machine shipped with it. Let say, i want to insert some records into tableA which is the record data is come from file, but at the same time i want machine has no problem in accessing tableA with different records without have to wait until my transaction is finished. But if there's error inserting process, then the transaction will be rollback. And the machine will stay running smoothly without any problem. What's the best transaction isolation level for this? In that code, machine will have to wait till the process is finished. Is there a way to solve this issue?.. Please help me, how to solve my problem..
How to use PDFBox to print Barcode? Thanks for your thoughtful advice. After reading PDFBox documentation, finally, i have successfully used PDFBox to display Barcode. The easiest way for doing this in Windows platform is by copying Barcode Fonts (.TTF) to Windows/Fonts, and then use the Font using PDFont class.